Nebraska marriage records starting in 1904 are available by mail for a fee, with proper government-issued photo identification, from the Vital Records Office or the county court where the license was issued. Marriage records are available to a spouse or parent. Fees may be paid by personal check or money order payable to Vital Records. See http://dhhs.ne.gov/publichealth/Pages/ced_macert.aspx for more information. 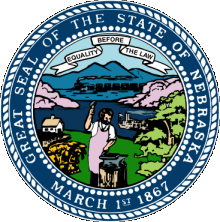 Nebraska divorce records starting in 1904 are available by mail for a fee, with proper government-issued photo identification, from the Vital Records Office or the Clerk of the District Court in the county where the divorce was granted. Divorce records are available by mail to a spouse or parent and fees may be paid by personal check or money order payable to Vital Records. See http://dhhs.ne.gov/publichealth/Pages/ced_dicert.aspx for more information. For additional information about Nebraska vital records in general, see http://www.sos.state.ne.us/rules-and-regs/regsearch/Rules/Health_and_Human_Services_System/Title-174/Chapter-3.pdf. Note: If a certificate is more than 50 years old, a release is not required. Record Access Requirements: Must have a notarized, signed release from persons of record or immediate family member for investigative purposes. Note: If a certificate is more than 50 years, a release is not required. Record Access Requirements: Must have a signed release from person of record or immediate family member for investigative purposes. Note: Appellate and Supreme Court opinions are available from the website. Search Note: State keeps record of requesters and will inform the person of record if asked. 100% of records are fingerprint-supported. Felonies are required to be submitted this agency, though not all misdemeanors are. Agency will refer you to the proper county. Search Note: Location, DOC number, physical identifiers, conviction and sentencing information, and release dates are provided. Any other information released is only done so by order of a judge showing just cause.